Love doesn’t always look like a fluffy little bunny or a bouquet of pretty flowers. Sometimes, love comes as a heavy burden, or an injection of medicine, or a strong arm that knocks you to the ground just in time. Jesus is like this. We often like to think of the Resurrection only. We have images of Jesus looking all bright and shiny and handsome, smiling, with his arms open wide in welcome – setting aside images of Jesus stripped, beaten, bloodied, his arms forced apart and nailed to a wooden beam. We’ll think of Jesus during his earthly ministry with little children gathered at his feet and blind people being gently touched by his soft hand – and not think of the whip in the temple or the rough carpenter’s hands praying in agony. 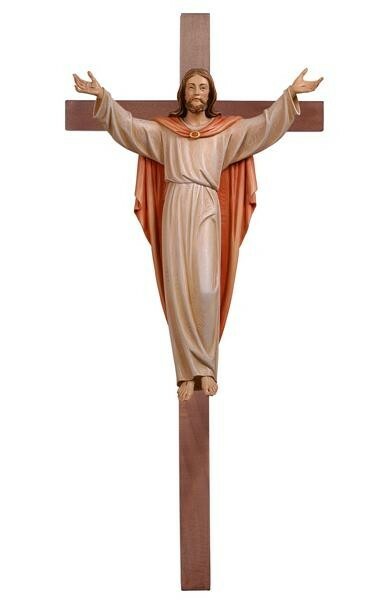 I have even seen Crosses that bear upon them an image of the Resurrected Christ, fully clothed. What’s with that??? That moment in the Bible when Jesus beckons the little children to come to him – this is not a purely happy moment filled with pleasant niceties. It comes with a rebuke. The disciples want to shoo away the youngsters, who are generally seen as a distracting nuisance – but Jesus says, “No.” He goes against the grain, disrupts the general practice of the time, upsets social protocol, and gathers the children to him. In the divine eyes of Jesus, every human being is a child – His own beloved child, whom He wants to hold in His arms and love unconditionally. In our modern time, to the people who, perhaps, make children over-precious and nearly adore them, this makes perfect sense. Of course Jesus wants innocent and lovely children near him. But… Jesus also wants the outcast and reviled near him. 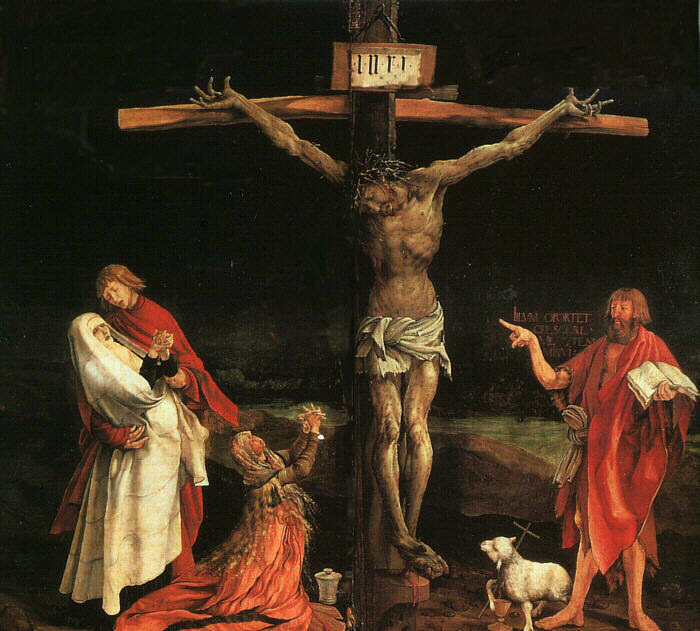 Jesus lovingly wills to die next to two thieves being executed for their crimes. Do we think of that? This is true love of humanity. Why, then, did Jesus drive the money changers out of the temple with a scourge that he made out of cords? (John 2:15) Why did he not have mercy and forgiveness upon them and just give them a big old hug? Jesus did have mercy and forgiveness upon them – he did what he did for love of them. He spoke to them in a language that they could understand about the wickedness of their acts and the dark path down which they were leading themselves and the people. This is a moment in the Bible when we can see Jesus as most obviously human – one of us. He is upset by the callous, unloving intentions and methods of the money changers, who are not interested in helping the people to be reconciled with God. Their interest is in making a personal financial profit from people’s desire for God, using the religious laws of the time to their self-centered advantage. This cannot stand. I’m thinking that Jesus is so filled with justified anger that he cannot humanly utter a pretty speech to sway them. This is the time for Jesus to use his muscles, muscles formed hard and strong from laboring in manual construction, and shake open the eyes of the drowsing, slap the petty and cruel upside the head, and zealously protect and cleanse the Sacred Place of his Father with a show of human force. I suppose that he could have turned all of the money changers into gnutes or rained fire and brimstone upon their heads – but, instead, he did what any one of us human beings could do… and, perhaps, should do: disrupt the status quo. Nobody likes to be told that what he or she is doing is wrong, even when it is wrong. Nobody enjoys changing his or her comfortable life for a promised, but unseen, improvement. We are naturally drawn to the comfortable, the soft, the easy, the shiny, the entertaining and sensually pleasing – yet, we are supernaturally drawn to the truth, to true love, to God. There is nothing more sublime, perfectly beautiful, and fully pleasing than God and true relationship with God – but that relationship requires a disruption of physical comfort, self-centered desires, and mundane niceties… in order to truly love. The Savior of the World cannot simply be an extraordinarily good man who sets a lasting example of kindness, patience, and a generous sharing of resources. The Savior of the World cannot merely come to make the world a prettier place – but to set it free from such a cheap desire. How else can God get through to us and break us from our habit of, and addiction to, self-centered pleasure? How else can God work with human hands, through all times and in all places, to lovingly hold the suffering and lead the wandering home? How else can God show us the fullness of what we human beings can be, except to become one of us and to give Himself so completely and utterly to us in unconditional love that he lets us torture and beat him, ridicule and reject him, and kill him like a common thief? The dead body of God-Incarnate hanging on a cross speaks more profoundly than any Sacred Book that could ever be written, more intimately than any lightning bolt Revelation from the sky, and more fully and truly than any radiant smile of the depths of divine love and how utterly God wants to gather us to Him. We stone prophets. That’s what we do. We “kill the messenger”. That’s what we do. God knows. And God loves us so much that He is willing to let us do that to Him. God loves us so much that He sends His Only Begotten Son to us – to do with what we will. Christ loves us so much that he is willing for us not to like him. He is willing for us to be annoyed with him, to mock him, to try to drive him over the edge of a cliff. He is willing for us to kill him, for he will do what he has come to do – he will love us. He will show us the way to deepest and truest joy, he will become the way. Jesus gives us the promise of things yet unseen and does not couch it in niceties. He gives his very body and blood for us to gnaw upon – and if we refuse to understand it, then he is willing to let us walk away. He will not force us to love him in return, he will not force us into his arms. But, he will weep for us, weeping tears of blood, and he will be vulnerable for us, pierced through in the excruciating pain of crucifixion. And the first sign of the veracity of his promise will be an empty tomb. This entry was posted in essay and tagged agape, beauty, being human, Bible, Catholic, Christ, Christianity, crucifix, gift of self, God, Jesus, Lent, love, Religion and Spirituality, self-love on March 30, 2015 by Christina Chase. I particularly like the image of “…love comes as a heavy burden, or an injection of medicine, or a strong arm that knocks you to the ground just in time.” We do look to Jesus as that loving, quiet man, but tough love is necessary for us when it is necessary for us. Very good take on that scripture.